“I can’t stop eating,” says comedian Jim Gaffigan. “I haven’t been hungry in like 12 years. “Did you ever see medication that says ‘Don’t take on an empty stomach’? Gaffigan isn’t alone. Overeating is a cultural phenomenon. And I’m not just talking about the obesity epidemic in America. I’m a relatively skinny person. I’ve always eaten moderately. And I’m conscious about the type and quality of the food I consume. Yet like Gaffigan, I haven’t been hungry in over a decade. And up until recently, I never knew what it was like to actually feel my stomach empty. And feeling my stomach has led to the realization that I habitually overeat. The cost of this unconscious behavior is great. The rewards in physical and mental energy that come as a result of changing this behavior are even greater. 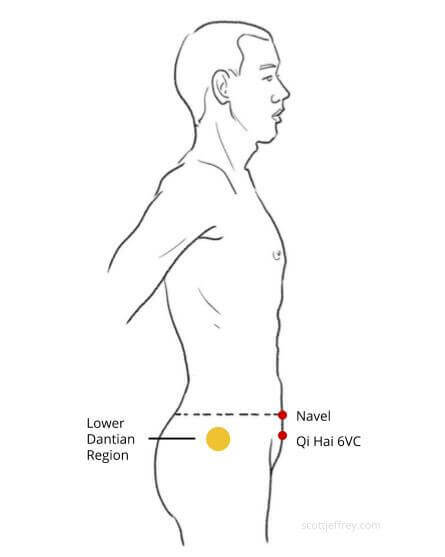 In the Chinese energy arts called Qigong, the theory is that we can cultivate a storehouse of energy in the lower abdomen (called the lower Dantien). This energy moves through the acupuncture meridians to heal and revitalize all of the body’s organs and systems. When cultivated, this energy, or chi, emanates heat. When the body’s channels are open, you can feel this energy moving throughout every part of your body. But in most people, this energy is blocked in many places. When I first learned about the body’s energy systems, I was fascinated by them. But I also didn’t really believe it. I have seen amazing feats by people like Qigong Master Zhou who can make a wet paper towel produce visible steam simply by directing his body’s energy through his palms (without actually touching the paper towel). But still, I remained skeptical. Part of me believed that only people with special talents may have this ability. Zhou, like many stories of qigong adepts, trained with various teachers starting at an unusually early age. Perhaps that was a prerequisite, I reasoned. Now, however, having experienced this heat myself, my doubts are waning. Consider this: The stomach is about the size of your fist. How big is your average meal? Sure, your stomach can expand more than 50 times its empty size to hold a large meal. But that doesn’t mean it should. I’ve discovered that too much food blocks the flow of energy in my body. When I eat less, I have more vitality. The body allocates energy to digestion. The average daily energy expenditure of digestion is 10%, but it varies depending on the type (protein vs. carbohydrate) and quality (whole food vs. processed) of the food. But more than that, excessive food trapped in your digestive system blocks the energetic channels in your body. Partially digested food in the small intestines and undigested waste matter in the large intestines is like a series of traffic jams keeping the energy from flowing smoothly. Have you ever gone on a multi-day fast or cleanse? I’ve heard reports from numerous people how much energy they feel while on the cleanse. But then, old eating habits invariably take over. Instead, try running an experiment for a week. Tell yourself that it will only be for a week. After a week, you will resume your normal eating habits. This reminder is important because if your subconscious mind feels like you’re forcing it into a new way of life, it will create resistance. Days 1 & 2: Don’t change anything in your diet. Observe what you eat and the overall quantity of food throughout the day. Take note of your overall energy. Days 3 & 4: Reduce your overall intake by about 25%. Focus especially on the first few meals of the day. Days 5, 6, & 7: Reduce your overall intake by another 25%. Now, you’re eating about half of what you ate at the beginning of the week. Use smaller plates. Research shows that we consume more food on large plates because portions appear smaller. Think about your stomach. When you sit down to eat, remind yourself that your stomach is the size of your fist. Pay attention to your body. We tend to eat with our brains (seeking pleasure) without placing awareness on our bodies. Ask, how do I feel right now? Does my body want more food? Stay hydrated. Many times, feelings of hunger are just a confused signal coming from the hypothalamus, a part of the brain that regulates both appetite and thirst. If you start to get hungry, drink water first and then wait 15 minutes. It’s okay to feel hunger. The feeling of hunger can trigger anxiety, which causes us to race to eat. Real hunger is probably foreign to you. When you notice this feeling, tune into your body. And breathe slowly into your belly. Deep breathing can reduce the anxious feeling. Challenge your beliefs about what’s best. Following advice from the “health and nutrition industry” can make you neurotic. You need to eat three meals a day. You need five meals. No, only eat once a day. You need 1,500 calories. You need to avoid this. You need to eat that. As long as we listen to outside authority, we can’t hear the wisdom of our bodies. Manage your emotions. Repressed emotions are probably the #1 reason we overeat. Simply becoming present with these emotions lessens the drive to sedate ourselves. Numerous research reports over the last decade have exposed the truth about dieting: it simply doesn’t work. People who go on diets gain more weight over time than people who start at the same level but never diet. There are many reasons for this, but the main thing to remember is that restricting yourself, in the long run, doesn’t work. Our willpower has limits. And our subconscious mind wins in the end. So don’t make this experiment about losing weight, improving your appearance, or getting in shape. These ideas are an attack on yourself. They will only create a counterforce within you. Instead, the focus here is an experiment to see if you can feel the energy in your body. You don’t need determination and will as much as curiosity and a willingness to experiment. Remember that the goal of this experiment is to test the hypothesis that you have a storehouse of energy available that becomes accessible when you eat less. How much less? That’s for you to determine. Just observe the sensations in your body—especially in your stomach region. When you start to feel the energy in the form of heat, you will want more of it. The positive sensations will create a new anchor in your subconscious mind (animal brain). This way, you’ll experience less resistance. And you can experiment further from there.